We are pleased to inform you that Treazures Workshop Escapade and The Olive Tree Café will be organizing a Beginner’s SLR Photography Workshop on 14th November 2009 (Saturday), from 3.00pm to 6.00pm. This workshop offers basic introduction to photography using a SLR Camera. 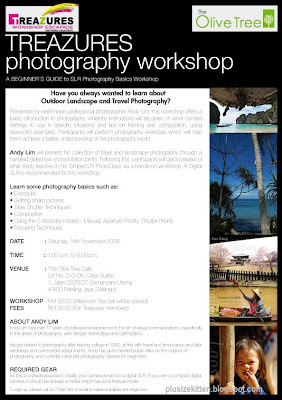 Mr. Andy Lim, a well-known professional photographer, who has over 17 years of professional experience in the art of visual communications will be covering the basics of different SLR Camera setting for specific situation as well as tips on framing and composition, using real-world example. For enquiries and registration, call Kelly at 03-7728 0184 or email kailee.chan@accent-edge.com. FYI, u can become a treazures member for free (limited time only, I'm not sure if it has ended). Register here. There will have a “Hands on experience on SLR camera” during the workshop. Therefore, we are still encouraged for those who do not have the required gear to join this photography workshop. All the participants still will have a chance to experience on the SLR camera. Hope can hear the positive respond from you soon and bring your friends along to join us in this Photography Workshop. if go , what free can i get??? hey John.. hmm i don't think get anything free coz this is a learning workshop. then only sign up for this workshop to get the member price rm35 cheaper! wow..summore got craft workshop ar? now still got? I am interested to join. heheheh. But I don have any DSLR camera. need a DSLR to join this workshop? the normal digital cam cannt?